Full Title: 'The South Part of Great Britain called England and Wales. Containing all the Cities, Market Towns, Boroughs and whatever Places have the Election of Members of Parliament, with ye names of ye Rivers, Seaports, Sands, Hills,, Moors, Forests &c. All ye Great or Posrt Roads, and principal Cross-Roads &c. With ye Computed Miles from Town to Town , and all ye Post Towns. as they are at present regulated by the Postmaster Genl. of the General Post House. According to ye most approved Surveys, and accurate Observations by Herman Moll Geographer A.D. 1710'. Published by J. Bowles, T. Bowles, Philip Overton & John King in London in 1710 [but c. 1740]. A very large folio map by the distinguished cartographer Herman Moll. 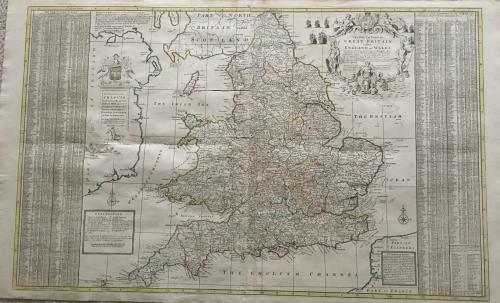 The map has original outline colour and is in very good condition and the paper is of good quality.